BETHESDA, Md. - A Maryland hero was welcomed home from deployment in Afghanistan in style Friday night-- by his entire neighborhood. Army Lieutenant Col. Benjamin Potter, an orthopedic surgeon from Bethesda, has spent the last four months caring for injured service members and Afghan allies. 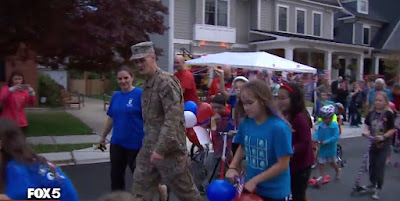 Lt. Col. Potter had a block party waiting for him to help him celebrate his return—and of course, a very happy family. The neighborhood scooter brigade parade is actually a tradition for the Potter family, one that pumps up the whole neighborhood.